I was reading Colorado Biz Magazine today - which, by the way, is a great publication! - and their article on passion in one's work got me to thinking (see Are you working for passion or a paycheck?by Laurence B. Valant). I count myself as quite lucky...I've found what I love to do in life, and have been able to turn it into a career. I climb, I guide, I create images, and then I share my experiences from the mountains with audiences around the world in my keynote presentations. But, it's not always easy. During my Everest expedition this spring, I wrote about The Hardest Part of an Everest expedition. Times can be tough on Everest, especially as a photographer. Leapfrogging climbers like Ed Viesturs, taking gloves off in the cold, working everyday, even when it's the last thing you want to do. Forcing yourself out of the warm, cozy tent for sunrise and sunset, and in wind and storm. Passion...that's what it all comes down to. With passion for our work, with passion in our lives, we can endure challenges. My passion for climbing mountains gets me through the storms and fatigue and numbing cold. My passion for creating images that tell a story pulls me out of the tent and brings the camera to my eye...even when I don't want to. My passion for teaching and sharing my experiences...and inspiring others to find their passions and push their limits...helps me work in tough situations with tough clients on difficult climbs and big mountains. And, that same passion helps me get over the nervousness before speaking to an audience of 8 or 800. And, passion does not end with the individual. When we are passionate about our work, we are eager to bring that same passion, that same feeling of joy in action, out in others around us. We are more inclined to assist a coworker on their path, to work more effectively with our teammates, and to create true success in all that we do. So, this brings me to today's Thursday Thought. It is by one of the greats, Kahlil Gibran, and his seminal book The Prophet . temple and take alms of those who work with joy..
Whymper, a British man who was trained as a wood engraver, made the first ascent of the Matterhorn on July 14, 1865. It is this climb - and its tragic conclusion with the deaths of four members of the party - that forms much of the story of Scrambles Amongst The Alps . In today's Aspen Times, the editors ran an editorial congratulating Aspen climber and skier Mike Marolt on his recent Everest expedition. The interesting part is that Mike did not summit. He turned around at 28,000 feet on his summit push. Why congratulate him?! He failed, right? Well, as the editors point out, and as I've written about several times, turning around close to the summit can be a heroic success as well. Often, in fact, deciding to turn around close to your end goal, with the summit in sight, is the harder thing to do, the more valiant decision. Mike Marolt could certainly have stood on top of Everest a few weeks ago. He could have done it...but he very well might have died on the descent, widowing his wife and orphaning his children. With the dream clearly in view, the summit within reach, Mike dug deep, undoubtedly wrestling with his emotions, instinct, and rational mind, and finally decided to turn around. I know how that feels. 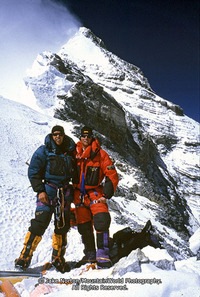 In 1999, on my first Everest expedition - after 17 years of dreaming about climbing the mountain - I, too, turned around 700 feet below the summit. I knew I could make it to the top that day, but wasn't sure the combination of the weather, our climbing speed, and my physical strength would enable me to get back down. And, let's keep in mind, you only get a summit certificate for a round trip! The decision to turn around on May 17, 1999, was the single hardest decision I've ever had to make in the mountains. But, later in the day, as the storms closed in, the snow fell, and our teammates Conrad Anker and Dave Hahn struggled to return to Camp VI,I knew my decision was the right one. No summit is worth a human life, a toe, a finger, or the pain and suffering of one's family and friends. The summit is simply a patch of snow, a convenient excuse to begin an endeavor which brings joy, growth, and passion to our lives. You climb the mountain in an equilibrium between restlessness and exhaustion. Then, when you are no longer thinking ahead, each footstep isn't just a means to an end but a unique event in itself. This leaf has jagged edges. This rock looks loose. From this place the snow is less visible, even though closer. These are things you should notice anyway. To live only for some future goal is shallow. It's the sides of the mountain which sustain live, not the top. Here's where things grow. So, again, congratulations Mike on a job well done, a decision well made, and here's to living on to enjoy the mountains another day.